Here’s a perfect cocktail for Halloween this year for any themed party! Combine all ingredients into a shaker fill with ice. Strain into the cocktail glass. Only add completely crushed dry ice. Dry ice is simply solid CO2 gas and it foes straight from solid to gas without a liquid phase in the middle (this is called sublimation). Buy pellet or add the dry ice into an ice bag and crush it using an ice crushing mallet or a similar tool. ALWAYS wear glove when handling dry ice. Wrap up a hot dog in true mummy fashion! With knife or kitchen scissors, cut each rectangle lengthwise into 10 pieces, make a total of 40 pieces of dough. Slice cheese slices into quarters (1/2 slice cheese, cut in half). Wrap 4 pieces of dough around each hot dog and 1/4 slices of cheese to look like “bandages",” starching dough slightly to completely cover hot dog. 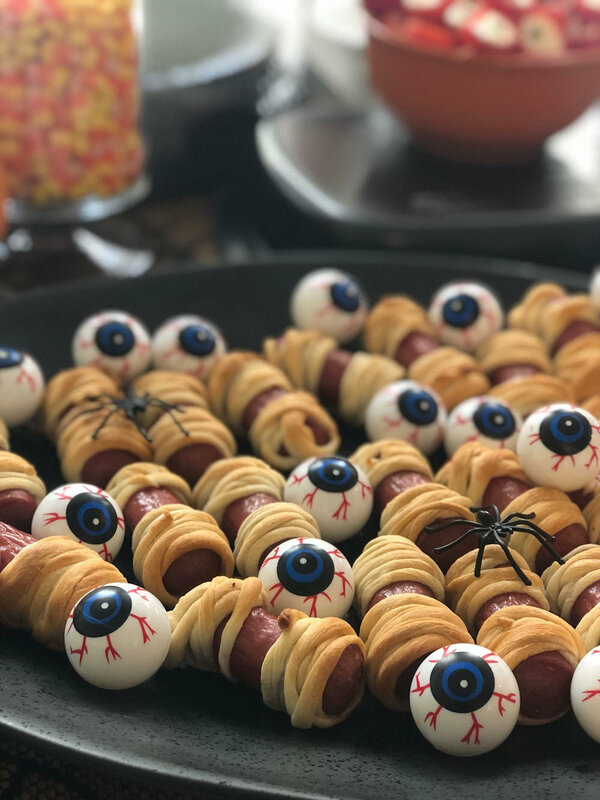 About 1/2 inch from one end of each hot dog, separate “bandages” so hot dog shoes through for “face.” On uncreased large cookie sheet, place wrapped hot dogs (cheese slide down); spray dough lightly with cookie spray. Melt butter in a large pan/Dutch oven over medium-low heat. Add the flour and whisk to combine. Simmer, stirring constantly for 1 to 2 minutes. Pour in the milk and whisk to combine and remove all lumps. Add the salt, pepper, onion powder, paprika, cayenne, and mustard, stir to combine. Continue cooking until mixture starts to simmer, 6 to 8 minutes. Remove from heat and add the grated cheese. Stir until melted and completely combined. Add the drained pasta and stir until completely coated.